Asalha Puja (known as Asanha Bucha in Thailand, Thai: อาสาฬหบูชา) is a Theravada Buddhist festival which typically takes place in July, on the full moon of the eighth lunar month. 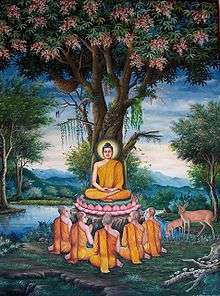 Asalha Puja, also known as Dhamma Day, is one of Theravada Buddhism’s most important festivals, celebrating as it does the Buddha’s first sermon in which he set out to his five former associates the doctrine that had come to him following his enlightenment. 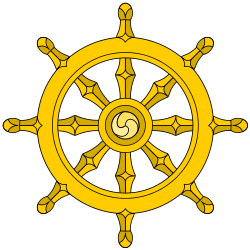 This first pivotal sermon, often referred to as “setting into motion the wheel of dhamma,” is the teaching which is encapsulated for Buddhists in the four noble truths: there is suffering (dukkha); suffering is caused by craving (tanha); there is a state (nibbana) beyond suffering and craving; and finally, the way to nirvana is via the eightfold path. All the various schools and traditions of Buddhism revolve around the central doctrine of the four noble truths. Wikimedia Commons has media related to Asalha Puja.